The Floating Voter Podcast: Is Northern Ireland the unwanted ugly stepchild of a failed marriage? 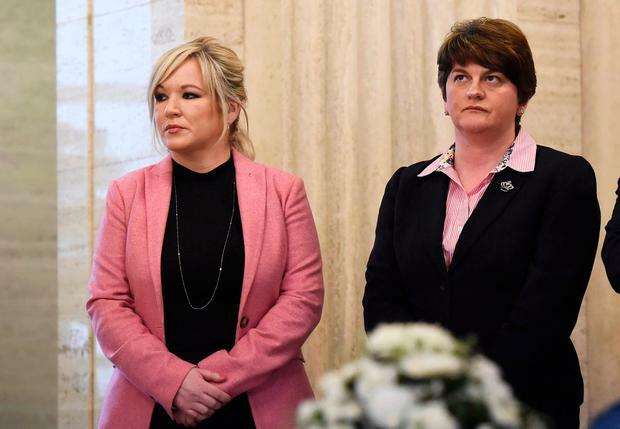 The North's political leaders, Sinn Fein's Michelle O’Neill and Arlene Foster of the DUP. This week on The Floating Voter, fresh from the Brexit Breakfast hosted by Taoiseach Leo Varadkar, Kevin Doyle is joined in studio by Philip Ryan and Shona Murray. Following the launch of Project Ireland 2040 we ask is it propaganda over planning? We bring you the analysis of Leo's speech at the Brexit Breakfast, scrambled egg, rashers and all. With Leo calling out Theresa May on being dependent on the DUP to prop up her government, we ask is Northern Ireland the unwanted ugly stepchild of a failed marriage? And as Fine Gael make more gains in the polls, we ask when will it be time to go to the country... again?